U.S. Air Force Brig. 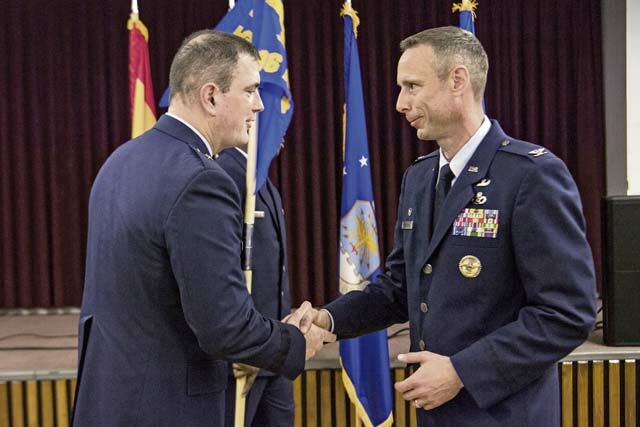 Gen. Mark R. August, 86th Airlift Wing Commander (left), shakes hands with U.S. Air Force Col. Travis Leighton, 65th Air Base Group Commander, after the transfer of authority ceremony April 1, on Morón Air Base, Spain. The 496th Air Base Squadron on Morón AB was realigned under the 65th ABG at Lajes Field, Portugal, to better the capabilities of the allies and NATO partners in the region. U.S. Air Force Brig. 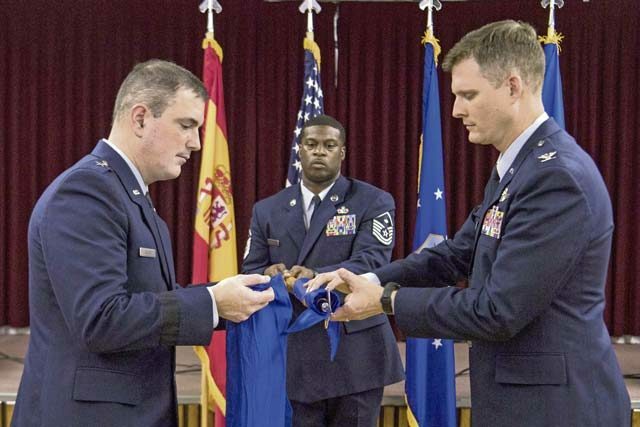 Gen. Mark R. August, 86th Airlift Wing commander (left), and U.S. Air Force Col. James Young, 86th Operations Group commander, cover the outgoing guidon, as the 496th Air Base Squadron is realigned under the 65th Air Base Group, April 1 on Morón Air Base, Spain. MORÓN AIR BASE, Spain — Members of the 86th Airlift Wing visited Morón Air Base, Spain, to realign the 496th Air Base Squadron from under the 86th Operations Group, Ramstein Air Base, to the 65th Air Base Group, Lajes Field, Portugal, April 1. During the ceremony, U.S. Air Force Col. James Young, 86th OG commander, transferred authority of the 496th ABS to August, who then transferred authority to Col. Travis Leighton, 65th ABG commander. Although the authority of the unit switched from the 86th OG at Ramstein AB to the 65th ABG at Lajes Field, the 496th ABS will remain at Morón AB. “Whether it’s with joint partners with the U.S. Marine Corps, bilateral relations with the Spanish, or now, evolving the mission to a multi-lateral with the 65th ABG and the Portuguese, it’s time to make a transition. The heartbeat and foundation will be all of you,” said August.